It's been a good week for unwrapping dazzling new stock, to add to our already full shop. And today we weren't disappointed, when we unwrapped this lovely P&H Cetus. 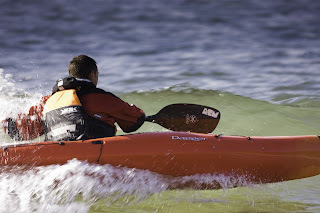 The Cetus is a full on composite Sea kayak and Expedition boat. Hand built right here in the UK, and finished to an amazing standard. The Cetus looks great just sitting on the shop floor, but will look even better loaded up with supplies heading out for a coastal adventure. Featuring 4 hatches, yes read it again four hatches, the Cetus has plenty of room for storage, it has a fully integrated skeg system, a comfortable and roomy cockpit and a compass recess up front. We don't hold that many composite Sea kayaks in stock, normally just a demo boat, and some plastic boats. Most people prefer to order one to their personal specifications and preferences. But we couldn't pass on this beauty when P and H told us they had a spare one in their warehouse. As Well as the Cetus we also got a Capella 167 composite Kayak as stock as well. 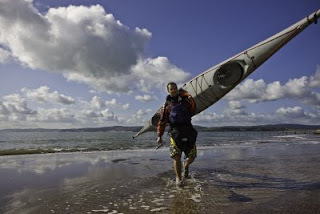 The Capella is P and H's classic all round sea kayak, great for day paddling, but with just enough space to manage the occasional expedition, and weekend away. 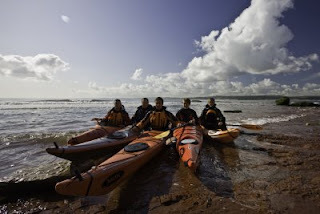 So if sea kayaking is your thing then why not drop in and try out some of the superb sea kayaks that we have available at the moment. But hurry, with boats that look as good as this they wont be here for long! Big Dog, Their the Mutts! We will soon have a range of boats from the new cats (hehe) on the scene! Big Dog kayaks are a new White water focused company with some thing for every one. Launched in 2009 Big Dog Kayaks are entirely dedicated to the production of innovative White-Water kayaks. Although the company is new, the key names in the Big Dog story need little introduction within either trade or paddling circles. Peter Orton, Jason Buxton and Andy "Snakey" Whiting have all held down influential development and managerial roles within the paddlesport industry. As paddlers they have represented the country on countless occasions. 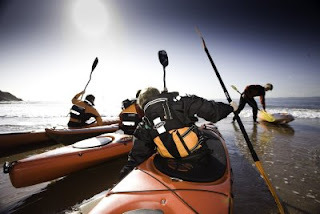 Many of the kayaks already accepted as benchmarks within white-water, sea, surf and squirt paddling were designed or developed by one or more of this team. Despite Big Dog being a new venture there really are few other companies, anywhere in the world, with this level of experience on their books. Big Dog believes that its focus is its strength. Many companies are diversifying into other areas of paddlesports, leading to inevitable compromises within their organisational and development teams. 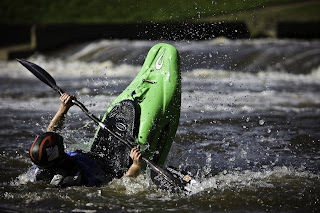 Big Dog has only one focus, making the very best White-Water-Kayaks available! Another of Big Dog's assets is that their whole management team actively paddle. 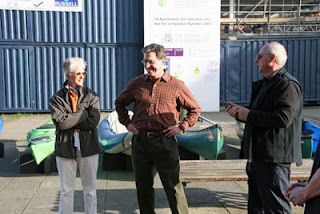 So next time you see one of the trio out on the water, paddle over, have a chat and let them know your thoughts! The Big Dog Force, all round river runner in two sizes. As soon as we have stock and demos you will know. 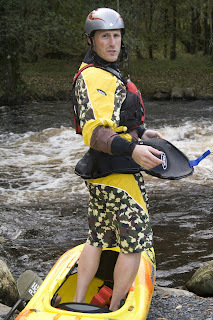 http://www.bigdogkayaks.com/ for the full range and catalog. Sweet Prophecy Cags are here! We now have the very slinky new Sweet Prophecy Cags in Stock. The Prophecy is made from super lightweight, and super breathable Gore-tex Fabric. It Features Latex wrist and neck seals, with outer neoprene protection on the neck seal and Velcro adjustable around the wrist seal, a deep neoprene waist tube, with Velcro adjuster, a double entry pocket on the chest, and a pocket on the sleeve. 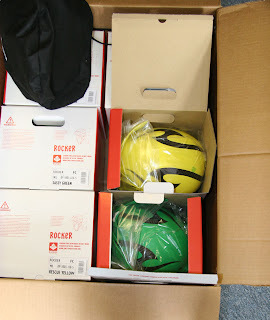 It contains the first instalment of our 2009 Sweet Protection Helmet order. We've not received all models and all colours quite yet, but there's more than enough to get excited about! We've received the 2009 Rocker Fullcut, in both the M/L and L/XL sizes and in Rescue Yellow, Sassy Green, Gloss White and Dirt Black. We've also received some of our 2009 Strutters, in S/M, M/L and L/XL, but we've only received the Hot Pink and Sassy Green colours so far. A Yak day out Part 3. Return to the river. After our nice hot morning at the beach we came back in to Exeter to hit the river and the "Mighty Pots". Flower Pots is the name given to the play hole at the base of the weir at the Mill on the Exe. In winter this spot is a great play hole for all the freestyle moves and used to see plenty of action in the days when the Exe Descent was running. We have also hosted a boater cross race there and a small freestyle event which we hope to bring back this winter. Andy gets some air coming down the weir. Jim keeping it tight and online. Ewart splashing about in the eddy. It's warming up so now is the time to look at shorty cags. Ewart in the Fusion. And we had to get this in. 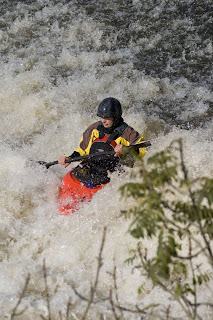 Not at Flower pots, this is Yak and Pyranha team paddler and friend of A.S, Mike Scutt. 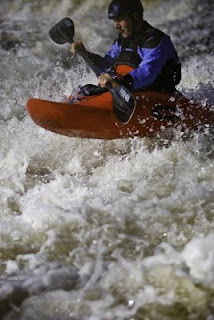 Mike works in Londons best kayak shop White Water the Canoe Centre and is a top notch paddler. He also loves the "Yakoflage" camo shorts. Tell us how much you like them so we can get them in to production! A few more pics from our day out with Yak. In part 3 we return to the river for some white water action. Ewart loves to surf. Any thing really! 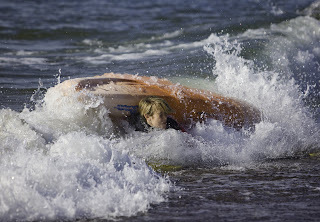 Boards and boats, usually surf kayaks, one of his 4 boards or a play boat. This time around he turned his hand to shreding in a Dagger Blackwater 10 . 5 Expedition, a 3 mtr day touring kayak usually more at home on the canal. (One of our Dagger demo fleet.) It went pretty well in the 2 ft beach break. Alice and Katie choosing their next play things. Katie with the best selling Perception Scooter. Alice not really asleep on the job? From time to time we actually manage to get away from the shop and go paddling! We also like to help many of the manufacturer's with their R+D of kit. This way we know when it hits the shelves you will get products that work. A.S tryed and tested! 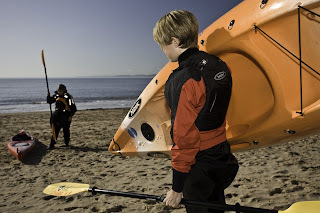 So with some new kit that we have had some input to we teamed up with Yak Paddling Equipment, a Photographer or two and hit the beach! All photos here were taken at Exemouth on the south coast of Devon! Just 20 mins from the shop door. Setting off. Jim loves the as yet unreleased Yakoflage camo shorts. With a lovely little reef wave peeling in the background the gang have time to rest and chill in the sun. L-R Ewart, Jim, Andy, Katie, Alice. We were very lucky this week to have some Genuine VIP guest in the shop. 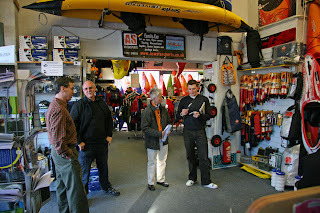 Whilst on a tour of UK Manufacturers and importers the President and CEO of Confluence Watersports, Sue Rechner, popped into our shop, in order to meet some English retailers. Confluence Watersports is one of the biggest Paddle-sports manufactures in the World. Based in the USA they are responsible for Wilderness systems, Perception kayaks USA, Dagger kayaks USA, Wavesport kayaks, Mad River Canoes, Harmony accessories and AT Paddles. They also have very strong links with Dagger Europe, Perception UK and WWC the importers for Wavesport, Wilderness, Harmony and Mad River. But she didn't just visit for a look round the shop and a chat, she was also interested in our feedback and input. She left with a good idea of what the British market was doing and where we, as a retailer, thought it was going. As well as a number of ideas about what we thought Confluence should be doing, and how to improve their current models and range.